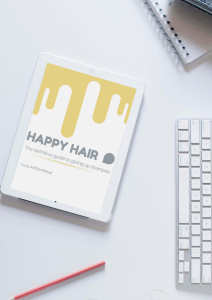 Happy Hair: The No Poo Book! Three years on and my e-book has sold thousands of copies, been translated into Spanish, and Portugese, and now I write about natural beauty experiments for the UK’s biggest beauty magazine, Cosmopolitan. And I get emails every single week from readers who are so pleased with their new No Poo hair, who have been surprised by how problem skin and scalp issues have disappeared, and who feel super confident in their new no poo regime. The Amazon Number One Bestseller as seen in The Telegraph, The Guardian and Cosmopolitan. 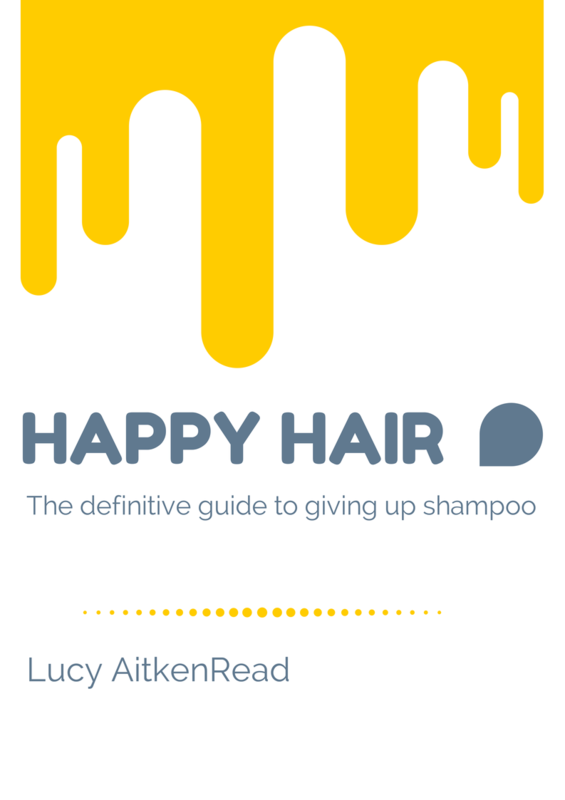 I wrote a book about giving up shampoo because finding out about No Poo online is HARD. There is so much information (and also a lot of misinformation) it makes for disorganised reading and is hard to refer to on your No Poo journey. Happy Hair covers everything you might possibly want to know about No Poo and you will be able to refer to the recipes (over 30!) and advice time and time again. Also unique to Happy Hair is a long section about how No Poo actually works including the chemical make up of the hair and the structure of the hair shaft. I am yet to see this covered this accurately on the internet. At a mere $5.20 or £3.40 (purchase in your own currency) it is a SNIP – less than a bottle of swanky shampoo. But unlike your shampoo it comes with a full refund if you don’t like the book. Extra Resource: The Six Week Fail-Proof Transitional Period for No Poo Success! 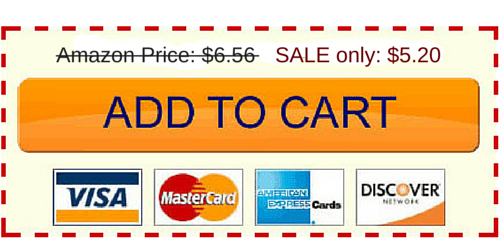 To purchase simply click the Add to Cart button, pay in your own currency and then download the PDF! You will also receive it in an email so you can download it later. Buy it at a discounted price from my e-store here – available in any country and purchase in your own currency. 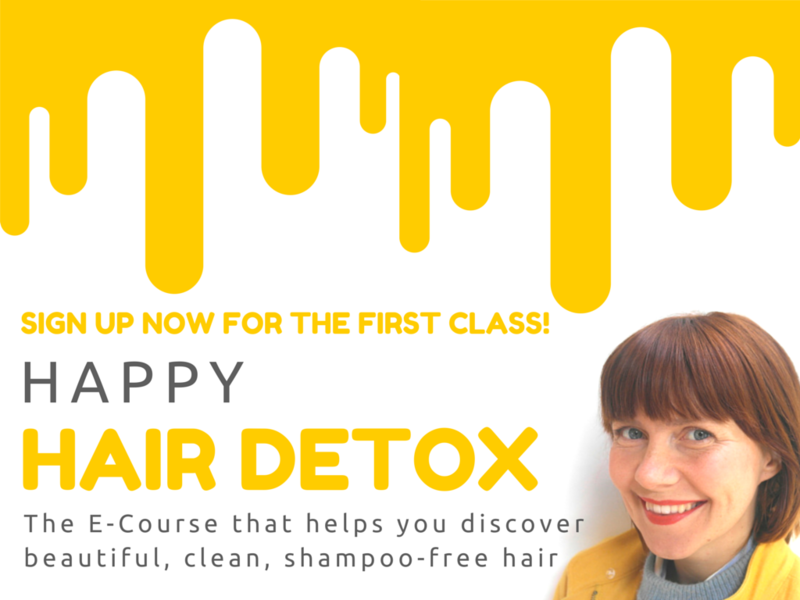 I am over the moon to bring you Happy Hair Detox – the e-course will help people detox their hair from chemicals and discover beautiful clean hair, naturally! Let Lucy, natural beauty columnist for Cosmopolitan and author of Happy Hair: the definitive guide to giving up shampoo, hold your hand as you begin your shampoo-free life. Lucy will be like a mash up of a brilliant boyfriend and Oprah Winfrey – here to stroke your hair and point out your magnificent beauty whilst also giving you lots of helpful information and inspirational wisdom to get through your tricky detox page. Includes 8 online classes, a peer-peer support forum, interactive downloadable worksheets and a free copy of Happy Hair. Sign up now with this link and get $10 off. Available only to Lulastic readers and for a limited time only. This course also comes with a 30 day money – back guarantee. The Daily Telegraph called my second book “a manifesto for life lived in nature!”. It takes the form of thirty short chapters, easily digested on the fly, to help you find a sense of home in the natural world. I am so sure that these stories of people who have been transformed and restored by connecting with the wild will inspire you to dive into a love affair with nature, and take your family with you. Help! I Have been shampoo free for well over a year (using Rye flour) but am still struggling to stretch the time between washes for more than 2/3 days. On the recommendation of a friend I bought your book a month ago and have been following the plan in the back trying differernt alternatives, but I still look greasy after day 2! I have very fine, blonde hair- could this be the problem- will I ever get to the point I can go longer between washes?? I’ve been trying this “no poo” thing now for about a week and a half and it’s going really well. My hair is adjusting well and am looking forward to gradually stretching it out further between washes. However, I do have a question. The hardest part so far I’ve found is the application of the shampoo/conditioner alternative. After reading the book and websites I’ve used a squeezy water bottle for the bicarb and water, and a spray bottle for apple cider vinegar and water. But over the weekend I tried the egg, I was really happy with the end result, but getting the egg into my hair was a nightmare and a total mess. Any suggestions about how to apply this? What to pour it from or similar? Thanks!! I’ve been on the no poo, no baking soda and no vinegar. Only rinsing with warm/cold water, scrubbing and scratching method. Its going on 3 weeks now. So far i am pretty impressed. The only things that i am having issues with ( the reasons why im typing this/looking for insight) are the following: Hair styles… if i try to wear it up my scalp is very visible in random and weird places.its a short bob cut. and not all of it will fit in a ponytail or bun. i have been afraid to brush my hair thinking that it would look terribly greasy, which is a look that i cant pull of at work. i have higlights that are now growing out.. 🙁 i think i will start rocking the bandannas for a while. <3<3 how does the scalp usually react to this change in "hygiene" ? kudos to all you brave women giving this a try and sharing with the world your experiences. Peace and love. I use the brush that came with my husbands clippers – it’s the cleaning utensil and looks a little like a brush used to apply hair dye. I then apply it just like a would hair dye – in sections, all over my head then put my head over the bowl and dunk the ends in. Place all the hair on top of my head and massage well to ensure every hair is coated, and then pour any remainder over my head and rub, rub, rub!! I’d also prefer a hard copy, but it’s listed as £999.11 on Amazon for a paperback version!! I wanted to let you know that my daughter (10) was staying with a friend a couple of weeks back and they got to watch some TV which is pretty rare for her, as we don’t have TV. She came back from the weekend raving about this lady that she saw on TV talking about how she doensn’t use shampoo or conditioner and had the most beautiful hair. She had memorised your recipe for baking soda and lemon, along with the occasional egg wash and has vowed never to use shampoo again (and has been following through with her plans). It’s pretty hilarious that the one take home message she got from that weekend of TV watching was a hippy mama inspiring her to wash her hair in baking soda aye! I’m sure that if I had tried to make her do it that way, she would just find it annoying. Anyway, I thought you would be interested to know that you are having an effect on hairwashing in our house! Oh wow! That is so cool! What a radical young girl! Found your blog while randomly googling and loved it so much I bought the book right away. I’m a hairdresser and I have tried everything to make my hair grow and be shiny and healthy, every product under the sun! I’m on holiday at the moment and my hair was duller and more brittle than ever! The only things from the book I had to hand was lemon juice and eggs, tried it and cant believe how shiny it and soft it feels from one wash and got rid of the grease build up! I am definitely going shampoo and conditioner free and will tell all my clients with the same problem about your book! Looking forward to every improvement! Thank you so much! Woah, thank you! Please spread the word! We’re deep in the No Poo for more than a month now – going really well so far! My scalp is white and calm. You don’t really notice how itchy it can get with shampoo, until you stop using it. – Do you prepare the bicarb/vinegar mixture every time before you use it? Can it be stored for later? – I tried mixing a (very!) small amount of coconut oil with lavender essential oil, to these lovely smells in my hair. It did smell heavenly, but it was so greasy I had to wash it the same day. As an alternative, I’ve mixed the two oils with some water in a spray bottle, but that was more effective as a room refreshener, as the smell did not stick to my hair at all 🙁 Do you have any suggestions? Hello- yay for your boyf!! Some people mix it up in bottles ready to go. I use it sooo infrequently (like ever 10 -25 days) that I just mix it when I am ready to use it. I would only use the coconut oil on the very ends of my hair, if it was particularly dry or curly. I use about quarter of a tea spoon on the ends before I go to bed, about once every ten days. I’ve been doing this now for about 2 months but my hair is still super greasy and waxy… any suggestions? What will happen when the ‘transition’ period ends? will my hair be just like it was before I stopped washing? I’ve been thinking about going poo free for a little while and today I bought your book and am excited to get started. However, I’m wondering, and I’m sorry if this is covered in the book, what I should do with my daughter’s hair so we can avoid ever using shampoo. She’s 11 months and I’ve used shampoo a few times, mainly when she had cradle cap, but I’d like to avoid using chemicals on her as much as possible. For babies would you advise just washing with water, or are there alternatives you can use to moisturise their scalp and keep their hair in good condition? How often would you recommend washing it, even with water? I know it probably varies from baby to baby but I’d be interested in your views. Thanks! Hello! What an inspiring book! I’ve been on the “no poo” method for 4/5 months. So far, I can see that my hair is getting stronger from the root…and thicker and longer. Everyone has to find their own way or system with “no poo”. When my hair gets super oily I wash it with beaten egg white, rinse with cool water and then I put the egg yolk, which it moisturizes and nourishes. After washing – apple cider vinegar/lemon/hibiscus rinse. Thanks for all of your inspiring posts! I’ve been slowly moving my hair from washing it less frequently, using natural (haha) shampoos, then Castille soap and ACV, and finally – nothing but water a couple of times a week. I just read your book – wonderful – and am now prepared for the next bit. I’ve been using a comb because I didn’t want to be distributing the oil – wrong! I know you said not to go out and buy a boar bristle hairbrush – but, of course, I did. I gave it 100 strokes last night – and it looks great. I did a bit of back combing this morning – even better. I’m feeling absolutely committed and doggedly determined to see it through the tough times – oily head, waxy hair, itchy scalp – whatever. I love the freedom of just running water over my head and going. I also use a lot of coconut oil – for deodorant, toothpaste, moisturiser, (and cooking), and lemongrass is my favourite essential oil. It’s all so simple. I read your happy hair book and loved it. I stopped using shampoo using BS and lemon instead. Got it down to washing once every 10-14 days after 9 months. Quite a few friends and my sister began shortly after me as well. I’m really pleased with how my hair looks and feels. Lately, I’ve been reading many posts about BS being bad for your hair because it’s so alkaline. Won’t go into all the details as to why exactly it’s bad. I was wondering if you’ve read these posts, whether you still use BS and have noticed any negative effects after years of using it and/or whether you have an opinion about this. I’ve been researching it extensively and even doing some home experiments with PH strips, but somehow it doesn’t entirely make sense. Thanks! I’m very interested in going Poo free but does your book address what frequent swimmers should do to get the chlorine out? On a runaway head – any alternative tips? Hi Lucy. Do you dye your hair? I was wondering if I could wash out the dye without any shampoo. I found your blog through a news article I read. I`m 37, my scalp and my hair are greasy and I have dandruff since some years ago. Does your book contain a natural solution to these problems? I wonder if you are thinking about doing the same type of research concerning to the face. It sure does! good luck! In the book, in chapter 5, there is a recipe for “Occasional Hot Oil Treatment.” I’m reading the Kindle edition… the recipe lists coconut oil twice. I’m wondering if this is a typo…and then what it should be? It’s a typo, scrub it! It’s corrected in the pdf version but not kindle because it is such a mission! I really recommend an oil treatment, but also recommend an egg yolk or two as the best, easiest way to rinse it all out. Lucy, I have been shampoo free for three weeks now. Last night I put avocado through my hair and now its like an oil slick. How do you get this stuff out?!! You need an egg yolk- or three- rub it all thrugh your hair and leave for five minutes, get every strand, and then wash with cool water. Your hair is gonna ROCK! Hi Lucy, I have been no poo for 3 weeks now (I use baking soda and ACV rinse), but lately I noticed that I have dandruff and I used the egg yolk, ACV, and Water mixture (I can’t purchase coconut oil in my country) but I don’t know how often should I use it or if I can replace the baking soda and ACV rinse, that I use once a week, with it? Yes, I would simply replace one of your baking soda washes with the egg. And also, begin using a rosemary tea for the dandruff as a rinse. So I’ve been trying to find for ages an ethically produced boar bristle brush…does such a thing exist (available in the UK) and where have others bought theirs from please? Hi Lucy I’ve been no poo since easter weekend this year (roughly 2 months), and have washed my hair with bs/acv, Castille and honey mix, Rh. Clay but I’m still not out of the woods. I’ve only had one time that made me think wow my hair feels fabulous and clean and I want to scream it to the world, but the rest of the time my hair is thick, greasy and waxy with brittle dry ends and always in knots! I’m determined not to let it beat me and your book has helped. I’ve just finished my first wax busting egg wash and I’m desperate for my hair to dry to see what the results are but am worried that this too will bring failure. The water round here is easy London/Essex is tougher than the Krays so will be using kettle boiled from now on but I have a few questions. 1) when you say vinegar in the book do you always mean ACV? Or can we substitute for rice vinegar or white wine Vinegar? 2) when you give your measurements in cups are you talking about any cup and or the actual American cup sizes- silly question but just want to be sure. 3) I want to test the alkalinity of my water as well as start making my own coconut oil soap, what and where, if you happen to know, would I get decent litmus paper from? Thanks for the fab book, fingers crossed it solves my problems!! 4) dies the acv need to have mother?? Are you happy with your Bristle Brush? Can work magic for hard water peeps…. ACV is kinder than other vinegars – but the principle is the same, it is about the acid contained within it. ACV is a really ideal pH. I mean baking cups – but to be honest, i just use whatever mug I have handy…. I have incredibly fine hair that has been brittle and lusterless for as long as I can remember. Furthermore it gets so greasy, even within hours of washing it. I have been looking for alternatives and stumbled upon your book. My one question: In my job, I am often faced with my hair getting styled. There is no way of avoiding this for me. If I have to use products on the job, is it still possible to maintain a no-poo lifestyle? I loved your book, and gave it a go but after 3 months struggle with Bristol hard water and huge waxiness had to quit. Then the dandruff returned…. So I have persevered, and finally found a way to make it work. I hope this helps anyone else with hard water and finds their hair gets waxy with no poo. 9) Avoid getting your hair wet with ordinary hard water when you shower other times of week. So I’m doing this once a week, and using shampoo once a week, and it’s not perfect but finally when I wash my hair like this it is as clean and feels as good as when I use shampoo – no heaviness, no waxiness. So maybe I will be able to drop the shampoo altogether soon, hurrah. For me the real key was learning to not do pure water washes, and to avoid the hard water on my hair as much as possible. How great that you have found a solution! I shall have to copy and paste this whole thing into a new edition of the book! I also think water in cities is to blame, not just for the hardness but for the chlorination – I think it wipes out the precious acid mantle. Hi! So excited to have found your blog! I have been on the nopoo method for two months now, and my hair just won’t make up its’ mind. The first three weeks were terrible! Then suddenly everything was great for about a week or two, but now my hair has gone back to being a greasy mess despite me washing it with baking soda once or twice a week. I had an almost-breakdown a few days ago and almost started using regular store bought garbage shampoo again. Instead I had A LOT of baking soda in my water and baking soda mix and also had white vinegar near my roots. My hair was great that day and the next day. I don’t like using baking soda since it dries up your hair in the long run, but I don’t see how I could stop. My hair breaks very easily and I want it to grow faster and longer – is there anything you would recommend me doing instead of washing my hair with baking soda every third day? Of course! There are soooo many better options- egg, soapnuts, rye flour, shikaikai. All really kind and nourishing. I would like to buy your book as a paper version but on amazon it is coming up at £999.00 can you explain why this is. Buying from the above link sends it to your email as a PDF so you can open it on any computer or iPad (just need a pdf reader app) or you can print it straight off to hold in your hands. Hi! I have not tried this out yet, but I me pretty keen on the idea. I have one question: Do you know how it works with a really thin hair? As my hair looks dirty even when washed, due to its being very thin. I would like to know if someone has tried this with thin hair, as it works differently than with thicker hair. Thanks! Hi Laura! I have really lank hair but this has added a lot of volume. Transition harder I reckon for those with thin hair but definitely do-able! I’m half way through the 6 week transitional period but wanted to have my hair coloured soon… If I did and obviously they used shampoo would I have to start it all again?? Every month or so you’ll probably be able to add another day to that! So glad you’ve found great hair! Hi, my son introduced me to the idea of no shampoo a few years ago. He has had amazing results. He was very oily and very balding on top. Now, he has a balanced and full head of hair. Hist most important rule is to vigorously massage his scalp in the shower daily for minimum of 5 minutes. I was happy for him, but didn’t see the need for me to follow suite. Then, my aging hair all the sudden decided to just quit on me. No products work to correct the dry, lifeless, flat mess. Last week I went and got a “gloss” put on my hair as a last resort, I haven’t altered the color of my hair in over 7 years. The improvement was small and the products recommended to me were many and samples given. A week later the results were not there at all. Radical action needed on my part. I remembered what my son said and decided to try it. Just 7 days into the process, my dry, lifeless, flat hair is looking less dry and responding. I also have implemented my Grandmother’s wisdom of brushing my hair every night for 5 minutes (though I need to invest in a natural hairbrush). Result to date: hair loss is almost nothing (before large amounts of hair would come out with each shampoo), better feeling scalp -massages are always good and my hair looks and feels less dry, though it is not shiney yet. I researched today in hopes of finding more info on this subject and found you. I too am a hard copy book person and want your book in hardcopy. It is no longer available on Amazon or anywhere that I can find. Can you direct me to find a copy? Guess the other alternative is to ask a print shop to bind one for me, but that may be costly, haven’t checked yet. Do you recommend a natural bristal brush? Thank you for fueling the understanding of smart hair care where less is more. Would like to add that after shower massage of hair, I use filtered water with organic vinegar as my rinse. I have tried in shower and this method and find a big difference. I will try with a boar bristle brush! I think patience is what I really need 🙂 thanks again ! I am loving your blog, which I found some of the interviews you did about your book. I have been no-poo for 6 months now, and recently moved to London. I had a wonderful stylist back in Canada, but I just returned from a pretty jarring experience at a hair salon, when I requested that my stylist not shampoo my hair. I am wondering if you/anyone else on this no-poo comment feed has suggestions of a stylist who will not recoil in shock/horror/disgust when I tell them I haven’t shampooed my hair since June. You are doing a great job, choosing the topics! Important and controversial. Thank you for the great job! I have been “no poo” now for over 2 years. My daughter (18 months) has rarely had soap on her except when washing hands. She occasionally gets cradle cap and I was wondering how you might treat it? I have used coconut oil and that works pretty well but it leaves her hair oily. Yes, we just use oil (when we bother) – the only thing (apart from normal shampoo) that gets the oil out is covering every hair strand with egg yolk!